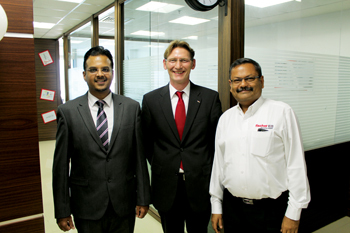 Fischer Fixing, a specialist in fixings and installation systems, is on course to set up its largest office and warehouse in the region in Dubai’s Jebel Ali Free Zone next year following its expansion in the UAE with the opening of a new office in Abu Dhabi. The move reiterates the company’s commitment to strengthening the company’s position and boosting its revenues, said a Fischer Fixing statement. “The Abu Dhabi office is our third in the UAE and 10th in the Middle East region,” said Jayanta Mukherjee, managing director, Fischer Fixing. As well as the new office in Abu Dhabi, the company has two offices in Dubai, including its regional headquarters in Jebel Ali Free Zone. The company’s products portfolio includes mechanical, nylon and chemicals and a host of other fixing systems. 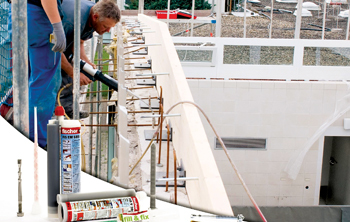 It also offers products for the façade industry. It plans to launch a number of new products over the next few months. “We are getting into firestop products in a big way. In line with government regulations, we have also got into solar energy as that is the future. Along with our core products like anchor fasteners we are going to introduce new chemicals into the market. All these products will help the construction sector in a very big way,” Mukherjee said. Next year marks the company’s 10th anniversary in the Middle East. “The year will see the opening of our largest office and warehouse in the region in Jebel Ali as business has grown so much that we need to bring in many more products from our five factories located in five countries worldwide,” commented Mukherjee. Set to open in the first quarter 2016, the new facility will include 8,000 sq ft of office and 22,600 sq ft of warehouse space. “We currently have our head office in Jebel Ali, but we need to expand; so we have taken up massive space and we will move to the new facility next year. We see a lot of demand for our products in view of the Expo 2020 in Dubai, Abu Dhabi’s Vision 2030 and the 2022 Fifa World Cup in Qatar. Once we move to our huge warehouse, we will have a larger reach into the market,” he added. “As a German company, we think ahead and plan ahead,” commented Alexander Bassler, regional managing director, Asia/Middle East, who stressed that his role is to convey to headquarters what the market needs are here in the Gulf. “Historically, we have grown in central Europe and the major part of our business is still done in Europe but there is growth outside and this region is very important to us. Our growth strategy, future planning and investments are primarily focusing outside of Europe. We are always looking at new markets and this has been part of the Fischer culture for the past 65 years,” he added. Some of its landmark projects in the region where Fischer products have been used include the Palm Island development, Etihad Towers and Mafraq Hospital (all in Abu Dhabi); Dubai Metro, Monorail, The Atlantis hotel and Burj Al Arab Hotel (Dubai); the expansion of the Grand Mosque in Makkah, the Haramain High-Speed Railway, King Saud University and Princess Nora Bint Abdulrahman University (Saudi Arabia), and Wakrah stadium, Qatar Islamic Tower office, Mall of Qatar, Light Rail Transit (LRT), Doha Festival City, Qatar Petroleum District, the Sheraton Hotel renovation, Msheireb Downtown Doha Phase Two and Hamad Medical City project (Qatar) and several airports in the region.